Arranging succulents is all about texture, form and color. Use contrasting forms to add interest. Think of the round foliage of a string of pearls plant in comparison to the rosettes of hen and chicks for example. The prickly form of the gold tooth aloe is entirely different than the glossy foliage of a Kalanchoe. Experiment with different textures and heights to create something entirely unique. Color also plays an important part in the design. Many succulents have colorful foliage. Think of the nearly black Aeonium ‘Zwartkop’ or the orange hues of Graptosedum ‘California Sunset’. Even the container can reinforce the color palette. In this video, a variety of warm colors are used and are picked up the terra cotta accent of the pot. Caring for a succulent couldn’t be easier. Their number one nemesis is too much water. 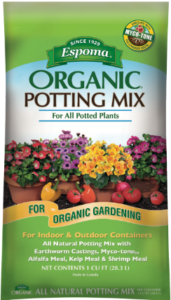 Pot them up with an organic, potting soil designed for succulents and cacti like Espoma’s Cactus Mix. This will ensure that the soil drains freely. Your succulents also need a special diet. Feed them with an organic liquid fertilizer like Espoma’s Cactus! Succulents love sunshine and their colors will be most intense in bright light. This is a highly ornamental plant that can be grown both indoors or out. The “foliage” looks like a string of green pearls. They cascade beautifully over the edge of containers and hanging baskets. This is a show-stopper that will attract lots of attention. Sempervivum, are commonly known as “hen and chicks.” Each spring new rosettes form that are called the “chicks.” This cultivar is known for its terra cotta colored foliage. The color is best in bright sunlight. Echeveria is also known as a Chenille Plant, ‘Ruby Blush’, ‘Ruby Slippers’, or ‘Red Velvet’ because it has a crimson color. The foliage has a velvety coating to protect it from the intense sun in its native habitat. ‘Zwartkopf’ is a striking succulent, with very dark purple, almost black foliage. The long bare stems are topped with a rosette of leaves and can bloom with clusters of yellow, star-shaped flowers. This versatile succulent is prized for its glossy foliage and brightly colored flowers that bloom for months. This is a stand out in a container and is extremely low-maintenance. They are available in a wide variety of colors. These golden spines may look mean, but they are actually soft and won’t harm you. In full sun the foliage will be tinged with orange. Watch for the red blooms in summer. Durable, grayish new leaves of this succulent will become tinged with pink in full sun. Happy plants will produce white flowers in spring. The “sunset” coloration is truly striking. Easy to grow and very low maintenance. Crassula, commonly known as the jade plant, are carefree and easy to grow. This beautiful house plant can also be grown outdoors in the summertime. Jade plants are considered to be symbols of good luck, prosperity and friendship. Check out these blogs to learn more about growing succulents.